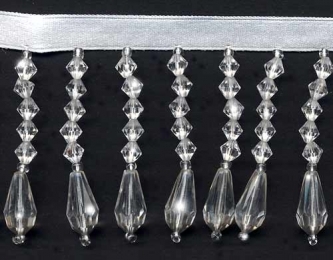 From our Decor Collection: This stunning crystal clear beaded fringe trim is 2" in length, not including the 3/8" white satin ribbon. The transparent beads are accented with seed beads also in clear. The Decor Collection is a fabulously heavy and beautiful beaded fringe trim, perfect for wedding decorations. Click here for more Images, Samples and Bolt Pricing for this item. Click here to go to our main shopping page. Price below is per yard.